find in a pile of laundry! Have you had one of those days when you feel like the life you had been given to live was just more than you can manage? Like the laundry you are supposed to get done is enough to clothe the entire U.S. Army? Yes I have days like that too. When my Laundry Pile is more than I can manage. Today was one of those days for me. I am tired, and really not so interested in doing anything that resembles being an adult. But you see God has given me a job to do, and he has reminded me that he doesn't like it all that much when I spend my time complaining. So I am going to put my struggles at the foot of the cross and ask Jesus to help carry the load. I want the Laundry Pile to be a place were we can gather and share the burdens that we have each day. This little side corner is a bit quieter. It is tucked away from most of the internet and hidden from view. I am glad you have made your way here, and I pray that this little nook will be a blessing to you. Yes we all have our piles of laundry. Some are stinkier than others, but if we told the truth most of our Laundry is pretty stinky. Come in and join us. I have finally managed to buy my own domain! Woot Woot. I want to let you know this site has moved. 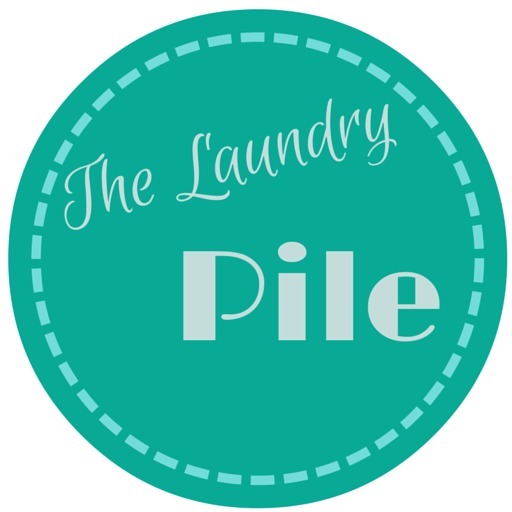 I am now at The Laundry Pile (http://www.thelaundrypile.com). Are you a fan of Veggie Tales? My kids just love them, and have watched most of our Veggie Tales videos at least ten times each and some we have seen more. So when I got the chance to review a screener for the NEW Veggie Tales Noah's Ark from Family Christian I jumped at the chance. The newest Veggie Tales adventure has a few changes that you will notice in regards to the animation and general over all feel of the content itself. It is similar to the new series that can also be found on Netflix. In this video Larry and Bob give us the story of Shem, one of Noah's sons, and how he struggled with letting God direct the steps of his life rather than making the choices himself. The theme is one that I think most adults can relate to well. I know I personally would rather choose to make my own decisions about the direction of my life than to wait on God's direction and leading. I really like the direction they took in presenting the story of Noah. I did find a few elements in the video not to my liking. One of the female characters is presented as a bit harsh or rather coarse. That could be taken as merely a joke, but it has a feel to its presentation that isn't the most honoring to women. In another section of the video Shem's wife gives him a direct command and he obeys like a boy obeying his mommy who has just been scolded. I do not appreciate this type of behavior being taught to our children as acceptable behavior. I feel that the husband is the head of the home, and should be treated as such. Those few elements were the only things that brought down my opinion of this particular Veggie Tales adventure. I do like the new styles of animation, as well as the important lessons of learning to trust God even when things are scary and dark. Overall I believe this is a good video and will be a commonly watched show in our home. I received a screener copy of the DVD Veggie Tales: Noah's Ark for the purpose of review from Family Christian. I have been given the opportunity to review a wonderful book by Tyndale House Publishers. They sent me a complimentary copy of the book Old Fashioned by Rene Gutteridge. This book is based on the screenplay by Rik Swartzwelder. The Movie will be released Valentines Day Weekend. I am not really a huge reader of romance novels. Occasionally I come across something that grabs my attention. This book: Old Fashioned is such a book. The book presents a love story that is counter cultural to our world today. It tells the story of a man who has made a promise to never be alone with a woman who is not his wife, and how his theories of dating and marriage play out in the real world. Clay Walsh, the main male character of the book has been living a life of isolation and solitude for nine years. During this time he has been holding some pretty heavy guilt about his life before he became a Christian. He meets Amber who tends to float in and out of places whenever things begin to require too much commitment. She drives out of town and on to the next place in her life when things get too hard or complicated. Their love story is not your common romance by today's standards. Most girls would not know what to make of a man who takes them for marriage counseling on their first date! The story progresses and quickly the reader becomes charmed by this Clay Walsh and his quirky yet chivalrous behavior. He has a way of making a woman feel like she is something very special, something to be cherished. I enjoyed this book. I don't read a lot of fiction, and I usually avoid romantic fiction. Frankly there aren't very many books dealing with romance out there I would consider to be safe reading. This book on the other hand is different. The main character is very real. Clay Walsh is a man who is struggling to find his way. He is working in his own strength, and struggles with his own failures and the failures of people he sees around him. Yet through several different people speaking into his life he grows spiritually throughout the course of the book. Amber's character is also realistic. She is likeable and honest. She expresses her frustration at this strange behavior from Clay as he struggles to find a way to lead in their relationship. I really love the honesty of this book. Neither character is viewed as perfect, but each one is moving towards a relationship with God in a powerful way. Even making mistakes along the way as they struggle to learn what it means to have a Godly relationship in a world that isn't. An underlying theme of this book deals with how men of our culture treat women, how women in our culture allow men to treat them and use them as objects. Clay Walsh is heart broken by his own treatment of women in his past so much so that he is crippled by guilt as he struggles to become a man of God. The book even demonstrates some of the fallout of Clay Walsh's behavior later in life. It is so true to reality. This hookup culture that is so pervasive today demeans the women and the men who are participating in those behaviors. Yet, Clay Walsh is taught that God has washed him clean of his past and there can be freedom. This book is a novelization of the motion picture Old Fashioned that will be released Valentines day. To see a trailer for the movie go HERE. In addition there is some amazing music they have created just for this movie, and you can pre-order the soundtrack HERE. In light of other movies that will be released this Valentines season I believe that this movie to be a good alternative. It saddens me that the content of this book is so radical by today's standards. Our popular culture would rather use a woman as a sexual object to be controled by a man rather than as something to be cherished. I love how this book demonstrates that Biblically the man is called to control himself and lay down his life for his wife, rather than be the dominate power used to control and demean women. I am thankful that there are men who are courageous enough to write about and even produce such a movie. If you are a church or organization and would like more resources on this move please go the Old Fashioned web site. They have a ton of wonderful materials that are available. How is the Decluttering going? This past week I have managed to get a few decluttering goals met. One big was that has needed work has been my fridgerator. 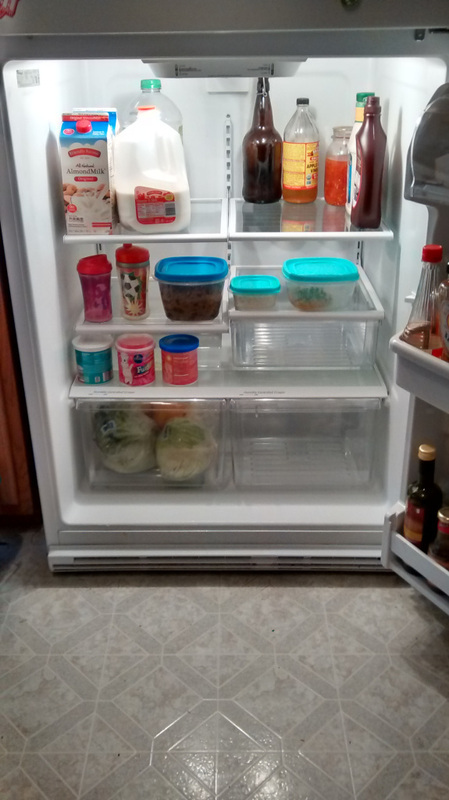 I have not cleaned out my fridge in a while and I finally managed to get it all scrubbed down and cleaned out this past week. It al so clean is sparkles! Can you tell I am proud of the work I managed to accomplish? I don't like how my home can get so messy so quickly, but that comes from having five young children. I want my home to be a place where my children can live and play so I need to learn to be ok with the messes that happen around our home. I have a few tricks that have helped both me and my children to be ok with the messes that we both make around the house. 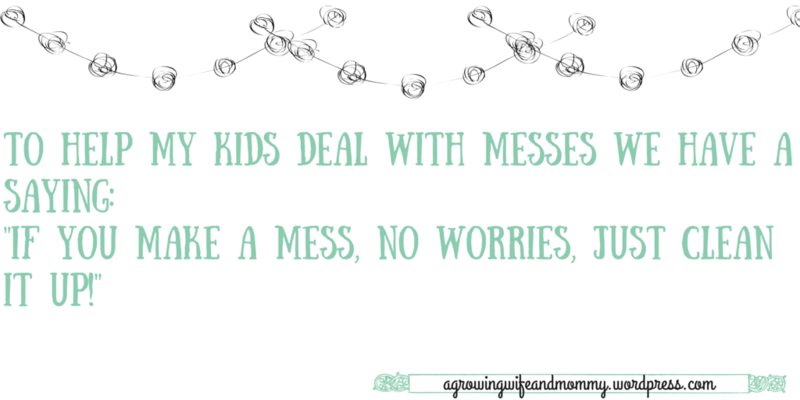 Reminding myself, along with my kids, that messes happen and we simply clean them up helps me to not take the mess so seriously. Any mess is only a little bit of work away from being a nice clean space for us to enjoy. How is your decluttering going? Have you been working on things in your home? Are you changing the focus or how you are going about your plan? Please share I would love to hear what you are doing. I am pleased with my progress so far on my journey to become healthier. I am learning that I can give myself grace but that it needs to be happening less than driving myself towards self-discipline. Self -discipline can be a struggle for me, but the more I am looking at it as an act of discipleship the easier it gets day by day. 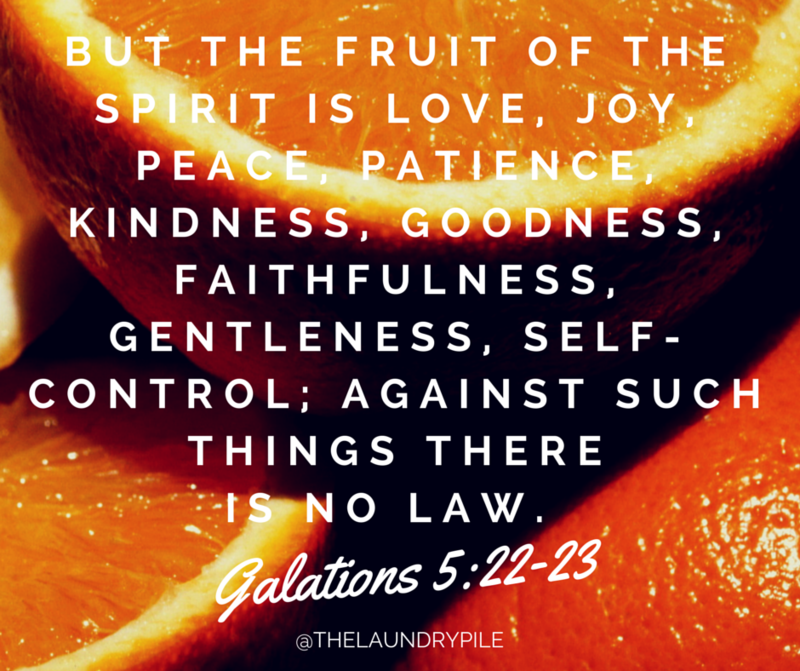 The Bible tell us that one of the fruits of the Spirit is self-discipline. These fruits of the Spirit have been given to us when we accept Jesus as our savior and the Holy Spirit comes to dwell within our hearts. I have the fruit of self-control. I have the fruit of joy. Those things don't always show in my life because I am allowing my sinful attitudes to rule instead of the new attitudes I have been given by the Holy Spirit. I have been given power to change my behavior and to act differently than I did before. I am not a slave to the bad attitudes that so often rule in my heart. I am not a slave to the temptations for things I should not have. God has made me new. I do find these verses so comforting. I did have at least one rest day this past week. I wish I could say I journaled my food each day but I didn't. I want to work on that a little bit more diligently this week. I have bunch of healthy salad stuff in my fridge this week so I am looking forward to being able to have a healthy alternative for my lunches. My workouts this week have mostly consisted of walking around my neighborhood. I have a little dog, and I have been walking her around with me. It has been good for both of us. She has reall enjoyed the change of her activities, and she has even been a bit more playful. Which is always nice to see. I have enjoyed being able to get out of the house and be outside. ALONE! My children are getting older, so I have a little more freedom than I once did. Our neighborhood has only two roads, so I am never too far away from my house. It has been nice. I have even been able to add time to my workouts. My endurance has actually increased faster this time than it did the last time. I think that my intentional changes in what I eat has made a big difference for me. I have been trying to avoid gluten. I think that it really has helped with some of my Fibromyalgia symptoms to be off of gluten. Time will tell. Study the verses above to keep my eyes focused on the God who made me. Be intentional about my meals, planning them out if necessary and taking time to eat what I should be eating rather than what is easy or convient. Making my goal for physical activity 8-9 minutes to see how my body responds. If I do well then maybe I can increase it again next week. Take at least one rest day from my exercise. What are your goals for this next week? I would love to hear what you are planning. I have a lot of goals ahead of me for this year. I have a lot of things that I want to get done, and that I need to get done. My home does need decluttering, as does my heart. I have been watching several bloggers who are focusing on decluttering their homes going systematicly through different areas of their house each day. I want to have the time to do a little something each and every day. The truth is I have not managed to work that way. Since the year has started I have managed to declutter one room. It was rather convient because we were taking down the Christmas tree and decorations. I could see there was a lot of cleaning that needed to get done in that room. I was also reading through The Nesting Place at the time. So I took a day and completely rearranged my Living Room space. This is the room a week later. Yes, there is stuff that needs to be picked up, and the walls need to be painted, but this room is much more organized this week than it was ten days ago. I will probably never win awards for home decor. That is simply not something I am skilled at, but we have a room where my kids can be cozy, relaxed and enjoy themselves as they go about their daily schedule. 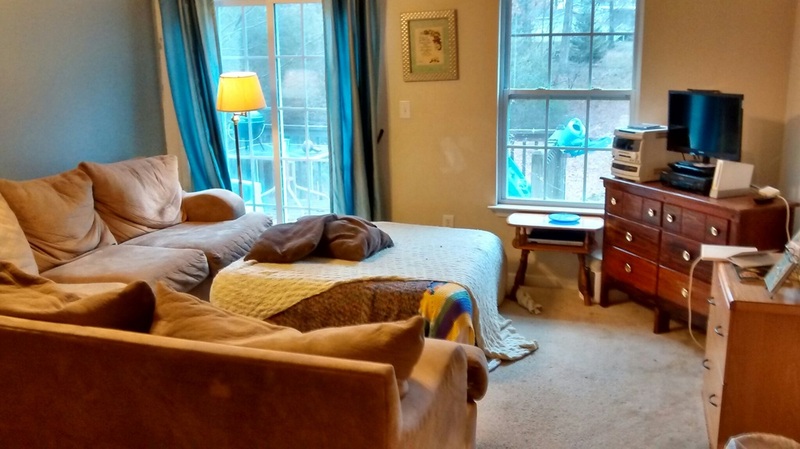 Mostly what I managed to do in this room is to move the massive couch that we have, and clean all the clutter and junk that gathers under the couch. I also cleaned off a few table surfaces and put a few things away. Are you decluttering this year? Is it going the way you envisioned it would? It has not be for me. I envisioned I would get done a small decluttering each and every day. I have been too busy to keep up with all that I want to be doing. What are your plans? How have you moved forward in your goals this week? Even in the smallest steps we take there is progress. I have been making tiny steps forward with my fitness goals. To some the progress is ridiculous and pointless because it is so slow. But I am thankful for the little steps that I can make each day. So far I have managed some tiny bit of physical exercise each and every day for the past 13 days. Some days it isn't more than 5 minutes, but it is still progress. I have also been working on being careful of what I am putting into my mouth. I still haven't stepped on a scale, but on Sunday I was able to wear a pair of jeans that have not been wearable for a few weeks. That is a wonderful thing in my book. Even so I find this stage in my progress can be a make it or break it place for me. Why? When I share with someone about my progress, how tiny my steps forward are, people look at me like I have two heads or something. The old ideas of, "But you don't look sick" keep coming back up. I remind myself that most of these people do not know what Fibromyalgia, and Chronic Fatigue do to the body, so education is very important. I don't look sick, but I am sick. Regardless of what someone may imagine of me, I am working to my best ability. Yet, discouragement tends to be lurking in the back of my mind. I see the judgement behind people's eyes, and my desire to be accepted and understood sees that judgement and lack of understanding and says, "They think you are lying, and that you are just lazy." And the harsh self talk, and frustration begings to rise. In addition self pity grows and my heart begins to become discouraged. I want this time to be different. I want to hold on to the tiny steps and allow thankfulness to grow in my heart instead of self pity. I want to be obedient to the Lord in this area of my life. I have lived so long eating whatever suited me at the time. Not considering how my choices were reflecting on God. 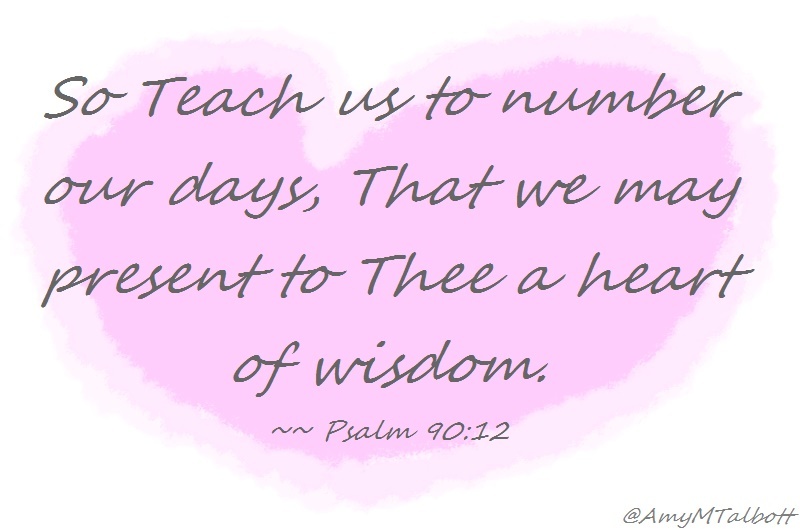 I do pray that the Lord will teach me to number my days. So that I will be following him in wisdom and care. I know what God has called me to do, and I know the situation in which God has called me to do it. I need to be obedient to the Lord's call on my life even in the area of physical fitness. And that means for me taking baby steps one day at a time regardless of the judgments of other people. Today we have been in 2015 for a week. I thought that would be good time to start my updates on my fitness journey. I really want to lose weight this year, and increase my energy as much as I am able to within the next year. So I started making a few changes. I got back on My Fitness Pal and I am logging my food each day. -- I had stopped this because I got discouraged and began eating just whatever, who wants to get on and log publicly all the bad stuff they are actually eating. I did try logging junk food for a while, felt a bit silly and stopped. I have been working hard to add fitness back into my daily routine. For that I am using a combination of apps. One is Map My Fitness. This has been fun because it has GPS tracking for walks and such. And it also links with both Google Fit, and MFP. I have logged exercise for the past 7 days. I am also trying to keep my phone on me as much as possible so that I can use Google Fit to track my steps. 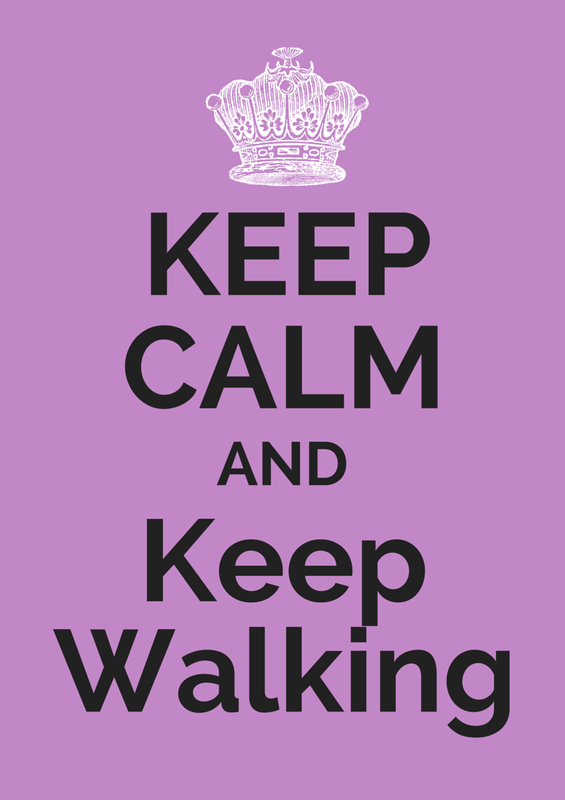 I don't know that I will hit the desired 10,000 steps anytime soon, but I do average about 4,000-6,000 each day just around my house. If I am out and about I can get a bit more in. That has been a helpful tool for me to really understand when I am having a flare up of the Fibromyalgia, I can see why I am so tired. I have been working hard at eating gluten free. I have learned that I have a gluten sensitivity and it tends to cause my health problems to flare up badly. I have felt much better as I have been reducing sugar and cutting back on gluten. I did have regular pasta tonight I don't know if that will cause me a problem or not. I have not stepped on a scale. I will at some point. I might tomorrow. I might wait longer. I have a tendency to get caught up with the numbers as they go up and down each day. Joyous over a 4lb loss, and devestated at a 3lb gain. In fact I have been known to have an ice cream pity party because the scale said I gained 2lbs. -- Not that is helpful! In the past week things have gone well. I have not really had any cravings yet, I expect I will soon. I am praying I don't cave. Are you working to lose weight in 2015? I would love for you to let me know. I would love to hear about our story and what you are doing. Please comment and tell me all about it. So have you ever read a book that caused you to rethink something. Like maybe your living room should be completely rearranged, or that perhaps the walls in your vanity that have been waiting to be sanded for 10 years should actually be done. Well, I have just read a book like that,and it has been causing quite a stir at my house! To be honest I am not so sure what I think about it. I suddenly grabed a sanding block to begin sanding the walls in my vanity last week. [I have wanted this done for 10 years now so I can paint.] And I got the wild urge to rearrange my living room today. All this work has taken away from all my laundry folding that I have to do! I have to tell you about this lovely book. The Nesting Place. by Myquillyn Smith. It is a that really inspires the reader to get up and actually do something. As we speak I am sitting in my newly rearranged living room. And you know what I like it! I have been putting it off and finally I became obsessed about it while reading The Nesting Place. I know that you will be happy to know that @TheNester is all over social media.She has a wonderful blog. I recommend you all go right after you read this post and check it outHERE. Her book gives you some imperfect principles, ideas and inspiration for ways to redecorate your home to create a space that is warm, inviting and over all just what you want. All the while doing these things even though your space might not be the perfect building you have longed for and dreamed of forever. She takes the reader on a journey over time telling her story about her homes and how she has decorated and changed up the living spaces she has inhabited over the years.